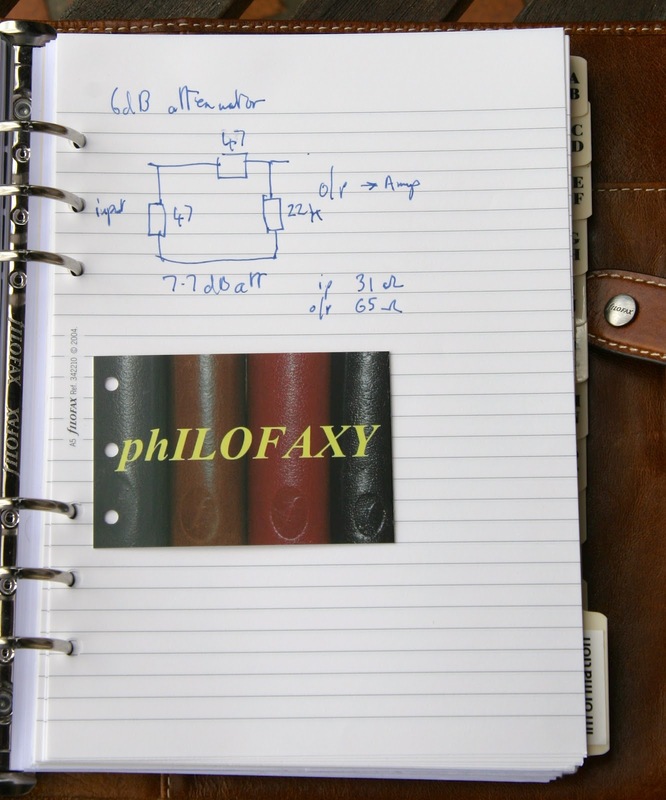 The standard Filofax lined paper is pretty good, but has a few limitations. The paper is thin and some pens, especially fountain pens, bleed through. The lines are further apart to accommodate my biggish writing, the header space is less wasteful and above all I can use 90gsm, fountain pen-friendly paper. Hurrah. 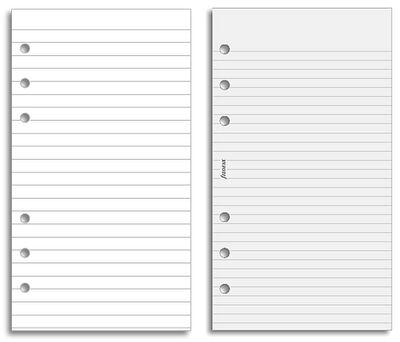 Here are the two side by side so you can more closely compare them - mine is on the left, with the standard Filofax page on the right. You can download the pages either as editable Word files or as PDF files. If using the PDF versions remember to set your printer settings so as not to shrink the pages. 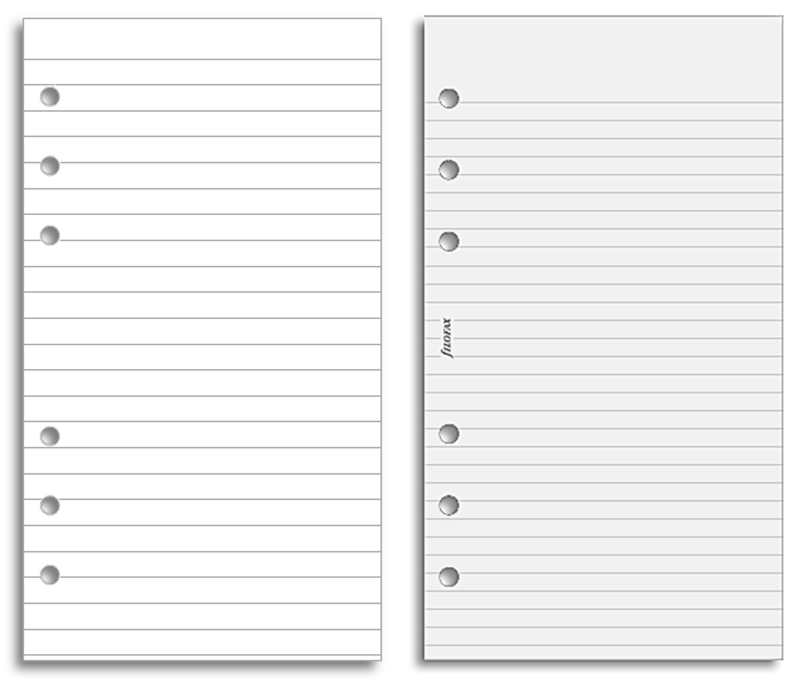 Download the pages as a Word file or a PDF file. Each file should be printed double-sided with the duplex set to flip along the short edge. 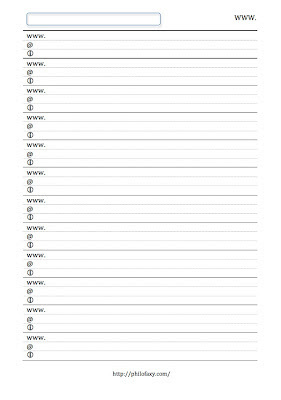 You can then cut out and punch individual pages as outlined in this post. I recently made a meal planner for the A5 Filofax available. I was asked to produce a version for the Personal size, which I am making available today. Certain compromises have been inevitable, but I'm really happy with the finished product. Print a number of these and you'll be able to plan ahead. Getting a whole week in one view just isn't possible in the Personal size, so I've gone with four days and allowed you to carve up the week as you see fit. The shopping list on the right hand side means that your menu and your grocery shopping can be perfectly aligned. When you know exactly what you'll be cooking you'll shop accordingly and save waste and money. Welcome to the tenth session of Journalling School. 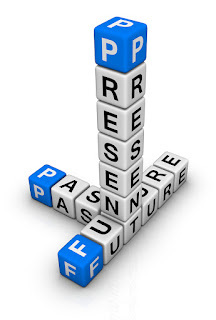 In today's session we'll be looking at the effect of tenses - past, present and future - and how to reflect these in your journalling. Generally, we write in our journal about the day we are experiencing now. Although we probably write in the past tense ("I visited Susan") it is present day we're talking about. But this is a convention, not a rule. There is no reason why we can't journal about the more remote past, or about the future. In earlier sessions of Journalling School, I have encouraged you to look both backwards and forwards in time in your writing - backwards when you are catching up on a break in journalling, forwards when you are addressing your goals. Today, we are going to take things a step further and write some time narratives to support change. A time narrative is a story really, but most stories begin and end in the past. These are stories that extend from the past into the future. The crucial difference here is that the ending has yet to be fixed. In the past I have wasted money without thinking. Right now I am starting to record and review my spending and make economies where I can. In the future I will have built up savings and be financially secure. Note that this narrative describes a change. The past and the future are very different from each other, and that difference is anchored in the present. The action I am taking now is the catalyst for change. In the past I allowed my friends to take advantage of me. Right now I have decided to stand up for myself, to use assertiveness techniques and say 'no' sometimes. In the future I will enjoy more balanced relationships where my friends support me too. I would call these examples 'outline' time narratives, because they summarise the story without giving any detail. Having written your outline, you need to go back and write about each of the three time episodes - the past, the present and the future - and build a much clearer, more detailed picture for each. You might spread this over several days, or decide to settle down for a long entry in your journal in one day. For your picture of the past, describe how things have been. Give some examples and talk about how these made you feel. Describe why you want to make a change. For the present, describe what action you are taking or are resolving to take. Keep this is the present tense ("I am saying 'no'" rather than "I will say 'no'".) If you are not sure on what action you need to take, you can use the problem solving techniques we looked at in Session 7. You can also talk to people, read and research in other ways. For the future, really build a detailed picture of how things will be. Imagine some examples of the new skills or approaches and describe how you will act and how it will make you feel. Spend longer on this that you think is necessary. The time and detail you invest here are key to lasting and effective change. Your unconscious mind will absorb every word and become your invisible ally in helping to bring the change about. Here is an interesting journaling exercise you can try from time to time. Try to imagine yourself one day in the future, when you'll be recording the events of the day and your feelings. Now write down today what you imagine you would be recording tomorrow. When you get to tomorrow's session, read back what you wrote and consider how close your predictions came to your actual experience of the day. What had you foreseen perfectly, for instance, and what hadn't you anticipated at all? Once you've done this a few times, look for themes. Are you surprised regularly by similar factors? Do you have any blindspots? How far do your expectations shape your experiences? Another spin on this is to write tomorrow's entry based not on what you expect to happen, but on what you hope might happen. What you're trying to do in this exercise is again to put your subconscious to work. It will try to find a way to produce the positive outcomes you describe, meaning your day is more likely to be a successful one. If there is a pressing change you feel you need to make, then write your own time narrative to describe your journey from the past, thorough the present and into the future. Start with an outline that resembles the examples above. Then look at each stage in more detail - I'd recommend that you tackle the past on one day and the present and future on subsequent days. Take time out to do any talking or research that you need when it comes to the present. If you don't have a particular change you need to make, then in your journal write tomorrow's entry today. Describe what you hope will happen as if it already has. Again, use detail to make the picture as vivid as possible and engage your unconscious in making it happen. That was the tenth session of Journalling School. In the next session we'll be examining the power of looking back in your journal. Feedback, thoughts and ideas are welcome, as ever. Please share your experiences in the comments. It's Blog of the Week time. 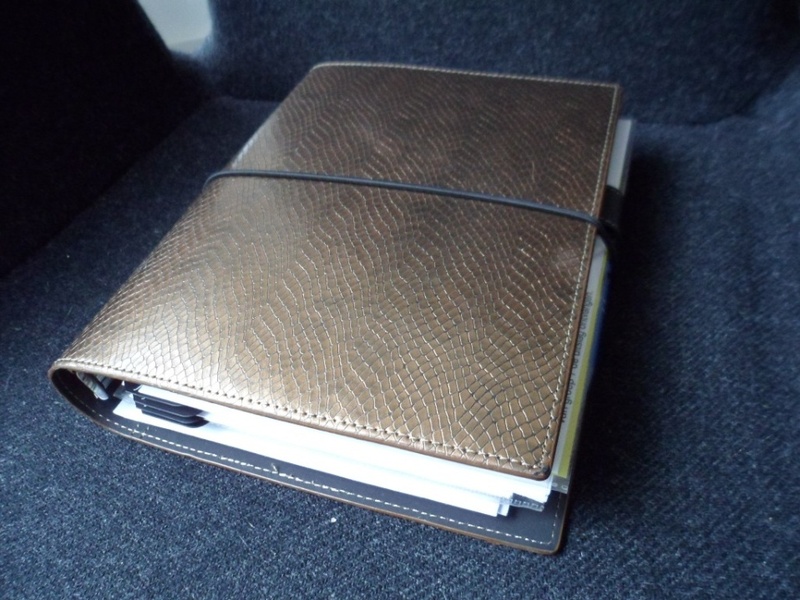 Each Friday, a different blogger walks us through their Filofax blog. This week, it's Deborah who walks us through Thoughts & Exploration. I'm still very new to blogging! 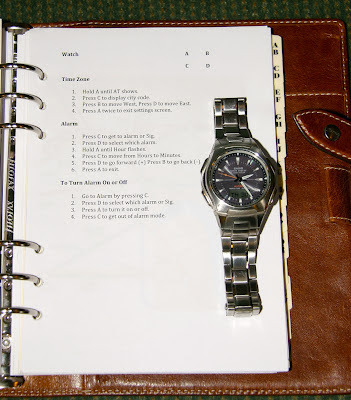 I published my first post on July 21, 2012 and it was a post on my Filofax Set-up. I always learn a lot from, and enjoy, reading about others' set-ups so I wanted to contribute and do one of my own. What were your reasons for starting it? I'm actually a late-comer to the blogging world. I wasn't really a blog reader until I found Philofaxy and then I discovered this whole big blogosphere! The idea of being able to publish something and have other people read it and get something out of it sounded really appealing to me. Most people enjoy talking about and writing about things that they like and things that they think about so it seemed like an interesting thing to do via a blog. Which post has enjoyed the most pageviews? 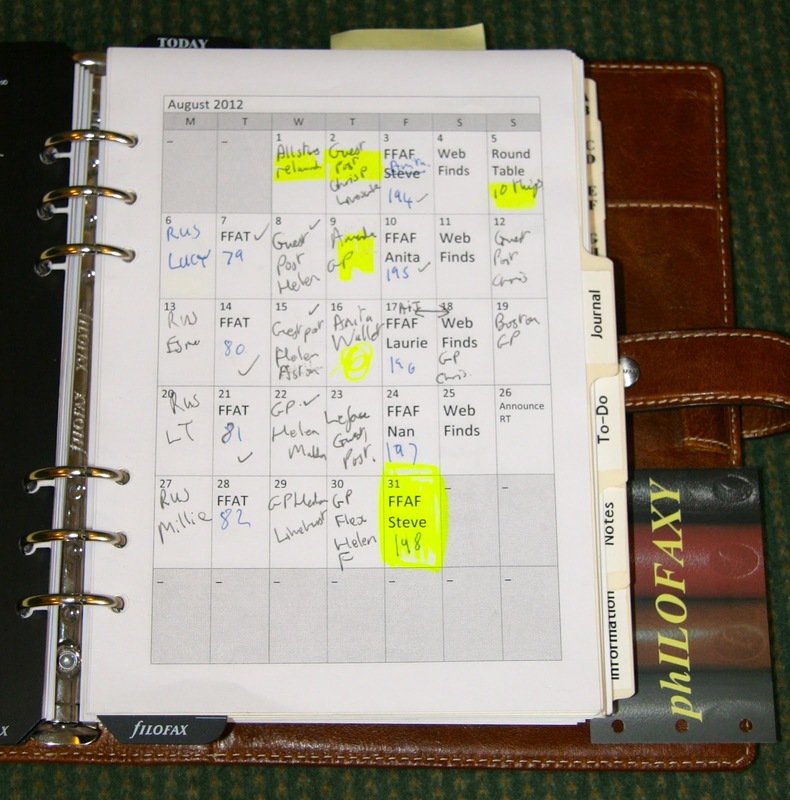 The post that has received the most views - over 1,400 since July 21 - is my inaugural post about my Filofax set-up. It can be seen here. Which post is the one you’re most proud of? The post that I'm most proud of is my post titled Growing Old. Funny enough, it only received one comment and has only been viewed about 20 times yet it is still my favorite. The reason? I put myself out there. Instead of a "superficial" type of post, I opened myself up a little bit and wrote about something personal, something that touched me deeply. I remember when I wrote it and why I wrote it. I sat there with my laptop in my lap and let the words and the tears flow. What has surprised you since you started blogging? Four things in particular have surprised me since I started blogging. The first - there are people from all over the world who are actually reading my blog AND I have followers!!! The second - the fact that some of the things that I've posted have inspired others. The third - just how many wonderful people I've "met" virtually. And the fourth - how much I enjoy blogging. In one sentence, how would you describe your blog to a Filofax user who hadn’t seen it? I think the one sentence I would use to describe my blog would be the fragment that I use at the top of my blog. My blog is, "A place to explore thoughts, ideas, passions..." It isn't a blog just about my use of a Filofax (although I love to write about that), it's a place to read a little bit about a lot of different things. 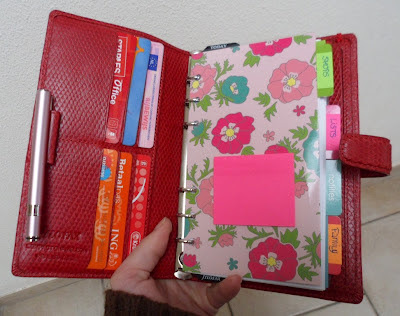 Finally, what one piece of advice would you offer to other Filofax bloggers, based on your own experience? I hardly feel like I'm in a position to offer advice to a Filofax (or any other type of) blogger since I'm so new to it myself. If I had to give advice to someone thinking about starting a blog I would say Go For It! If you are toying with the idea of blogging it's because you have an interest in having your own place where your voice can be heard. Don't be afraid to do it! And advice for an established Filofax blogger? Oh my! I guess it would be that people (at least I) like to get to know you through your posts. The more personality you let show, the better because it lets us, the readers, connect with you. Oh and one more thing (I know, you said one piece of advice but I can't help it)...when possible, include images/pictures in your posts! I'm one of those readers that loves picture-heavy posts. Now, what I would love is to get advice from all of you on how I can make my blog better! Suggestions are always wanted and welcome! Thank you, Ray, for featuring me and my blog on your wonderful site! I'm honored! My thanks to Deborah for participating. 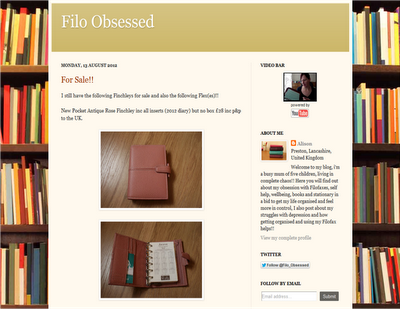 If you own a Filofax blog and would like it to be featured in this series, please complete the questionnaire. I maintain a large number of notebooks for a variety of purposes, so many that it is often difficult to keep track of them all. There is also a notebook graveyard in a cupboard where completed and defunct notebooks go - because you never know, right? If I ever need to refer back to notes I remember making in an old notebook this system makes it easy. Welcome to the ninth session of Journalling School. In today's session we'll be looking at some of the questions that have arisen so far and that often come up in relation to journalling. So, let's have a time out and look at some questions that have come up. I'll give you my view, but there is scope for argument and you are welcome to add your views in the comments. What sort of book or system should I use for my journal? Bound. I advocate a bound book rather than a loose-leaf system, mostly for psychological reasons. When you write on a loose page, you are less likely to take care about what and how you write, because the page can easily be discarded. In a book, though, you will have to live with mistakes and misjudgements, which means you are more likely to take care not to make any. Spiral binding is a bit of a compromise, but I'd always go for a fully case-bound book. Small but not tiny. Your journal should be portable. That is not to say it should accompany you everywhere, but when you take vacations, you'll want to take it with you. Even when you go somewhere just for a day, if you know you'll have spare time, you should take the journal with you and write while you're there. I always find the nature of my writing changes with my location, and I like the variety. But your journal should not be so small it can fit in a back pocket. I find anything smaller than about A5 discourages proper writing with grammar and structure. Free format. I'd strongly recommend you don't buy a dated diary to use as your journal. You might well not write every day and empty pages will taunt you. It is better to just start again after a gap in time without a gap in the book. Pre-dated pages also limit the amount you can write in any one day, whereas I don't believe you should be limited in any way; you should be able to write as much or as little as you want or need to. Inexpensive. Once you are firmly in the habit or journalling, you might decide to spend good money on an expensive journal. That's fine. When you're starting, though, it is likely to cause you problems. When you're so worried about sullying those expensive pages, you can end up writing nothing at all. I call this 'journalling stage fright'. Avoid it by using an inexpensive journal, at least for your first volume. My journal book of choice is the Black n Red A5. Can I keep an electronic journal? Of course you can. Personally, I find this harder than writing by hand. I can't write as quickly as I can type, so my ideas are more fully-formed when I write them by hand. I can always open my book and start writing immediately, whereas it may not be convenient to get a laptop or pad out wherever I am. And I like to see the book filling up gradually. To be able to flick back and forth and to see the odd crossing-out - and remember why I crossed it out - is useful too. How much do I have to write? However much you want or need to. You're not writing lines as a punishment; rather, you are writing as an investment. You are investing time and effort in understanding yourself and the world a little better, in making progress towards your goals, in solving problems, and in building a resource of unimaginable value in the future. Some days you might want to write and write until your hand aches. Other days you might want to write just a paragraph, or nothing at all. It's all good. There is no minimum word count and there are no deadlines. Hopefully by this stage, you're not short of things to write about, but it is worth thinking about any trends you are finding in your writing and where you want to go in the long term. For example, it is easy to get into the rut of just recording the events of the day without any real comment or reflection. At the other extreme, it can all be about you dumping what's in your head. I think over the long term everyone needs to find the right balance between being externally focused (what's happened today) and having an internal focus (what am I feeling?) There may be spells in your life when the balance between these has to change. For example, in times of stress it is important to vent your feelings fully because this makes such an enormous contribution to you being able to cope and recover. Beyond the events of the day and your reactions, though, there is a wealth of things you can write about, as I hope this series has demonstrated. For instance, what are your goals, and how are you working towards achieving them? What are the big news stories currently, and what's your take on them? What would you do if you won the lottery next week or if you were stranded on an isolated island? If you were to throw a dinner party and could invite anyone, who would you like to come and why? In short, write about whatever occurs to you in the moment, but also invest some time in thinking about what you want to write about in the future. Keep a list of things you want to write about when you have time to write a longer entry. How careful should I be in case people read it? This is a difficult question. There are some benefits you can derive from journalling only if you are totally honest and free to write whatever you feel. There are people who can do that, but I'm not one of them. I have an internal censor that requires me to be as honest as possible, but circumscribe where fragile people and situations are concerned. That means I might sometimes not share all of my feelings with the page. It's difficult to say why this is; my journal is not written for publication, not for reading by anyone but me. Even my wife doesn't read it, although she's seen me writing in it, often at length. But somehow I feel that if she (or someone else close to me) did ask to read it, I wouldn't want to feel awkward about letting them. This is a question you'll have to answer for yourself. Do you mind saying 'no' when people ask to read your journal? Is there a risk that people will read your journal without your permission? Do you even worry about what other people think? There's no homework this week, except to consider whether you have any questions that haven't been covered. If you do, put them in the comments. That was the ninth session of Journalling School. In the next session we'll be looking at the effect of tenses - past, present and future - and how to reflect these in your journalling. All Stars Guest Post by Judith: Today, I touched all of these Filofaxes! This is a real treat. The wonderful Judith has written me e guest post on using her Filofaxes. You're going to love it. When you've read this post, be sure to check out Judith's fantastic blog, We Really Didn't Need Another Filofax Blog. Okay, weird title, I bet all the leather fetishists out there are now clicking the link to this post …. Last night, when I tried to reclaim the space we call our living room after our precious kids went to bed, my eye fell on that pile of Filofaxes sitting on the table. My first thought – getting a bit annoyed with myself – why would I have so many Filofaxes on my table?! Then at a closer look I realized I had actually not only touched, but USED every single one of them during the day. Let me give you a tour! Back home at my office desk: start of work day. First thing thing to do, is flip open my A5 Vintage Pink Malden to check my day! Have to send out a letter and need to look up the address. Which is in my A5 pink Finsbury! While dinner is cooking, I’m updating my A5 Malden for the next days. Kids are all in bed, BF is working, I have the house and time to myself. 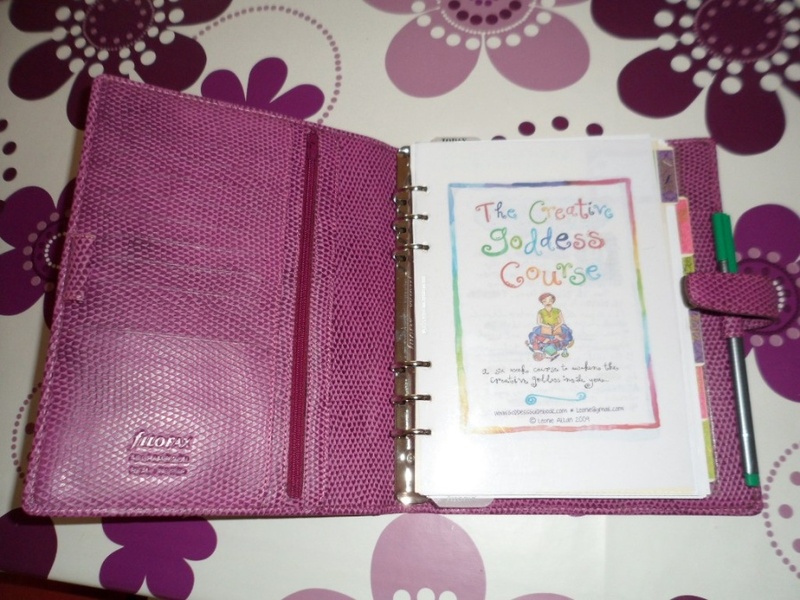 Wonderful time to dive into my Creative Goddess e-Course. I have printed all ebooks on A5 paper and put them in my A5 raspberry Chameleon. End of day. I am writing a bit in my daily logbook (Moleskine Color a month volants), which is stuck in my Slimline Cuban. I’m also updating the kids’ logbooks (weekly cotton cream inserts in the Cuban). And that – dear people – is how I came to use 6 different Filofaxes on one day! So, how many Filofaxes have you handled today …? And thank you Judith for choosing to share this post with my readers. It's Blog of the Week time again, in which weekly a different blogger walks us through their Filofax blog. This week, it's Imogen who walks us through Imysworld. I have no actual idea, as the blog started before the first post, I just deleted all the original posts! I just wanted to have somewhere to share things, I started off sharing what I had bought etc, really unexciting things, and I had no viewers or comments ever! It was quite a pointless blog until I decided to talk about stationery! Weirdly enough it is a post about a Chanel handbag I have been dreaming over for years, it is of pictures of me and the bag and asking about it. It has 3,443 views. 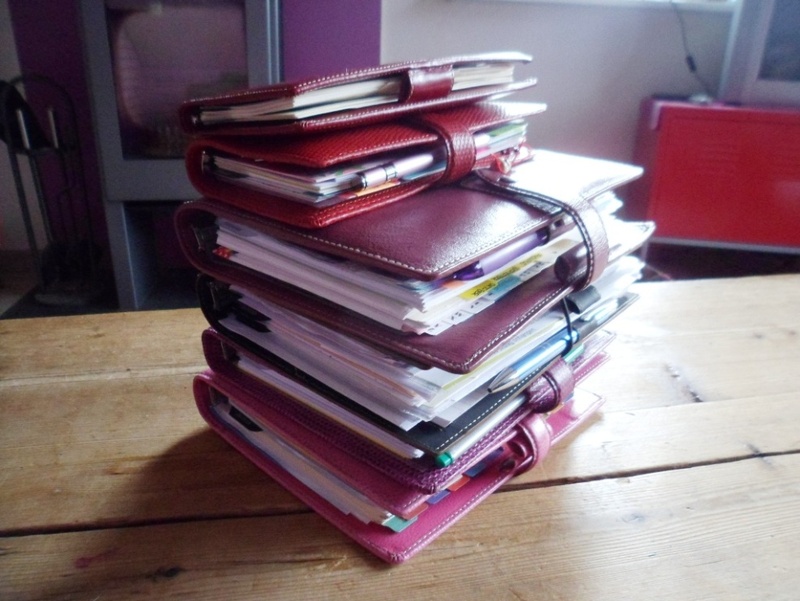 I think the post I am most proud of are two I have done recently (here and here), they are about why I prefer my Filofax over other devices etc. I also have one Youtube video I am very proud of, it is one about my condition it is just the response I have received from it, really blows my mind, it completely shocks me! It isn't my most viewed video but its the one I have had the best response from and it just makes me feel proud of what I have achieved just from doing one small video! Especially considering my most viewed video has 33,000 + views! Just overall how many views I have received and how much people have loved my videos, it really means a lot when people are telling me how much they mean to them and how much they adore them. Just go for it, don't wait around for someone to tell you to do it, or what ever, don't worry about what if someone doesn't like me etc, they don't deserve to read it. Just write what you want and keep going until you are bored. It can be such a fun release so just go for it and blog your little socks off! My thanks to Imy for participating. I was asked by a reader, Jane, to create a weekly meals planner. She wanted to be able to plan for the week ahead, shop accordingly and at the same time track her spending against a budget. I created a four-page planner that might be of use to anyone who wants to take a more organised approach to feeding themselves or their family. Here's what it looks like. The first page is about establishing a starting point for the week in terms of budget and what is already to hand. Then comes a two-page spread with meals on the left and categorised shopping lists on the right. 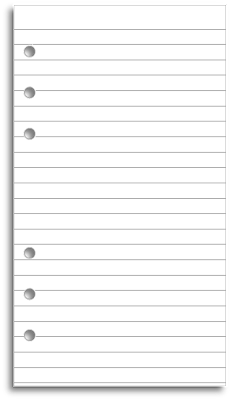 Finally, page 4 allows you to add non-food shopping and to review your week and look forward to the next one. You can download the pages as either an editable Word file or as a PDF file. Either way, it is set up as an A4 document for you to print in booklet mode and then cut in half. Mirrored gutters allow space for the holes to be punched. 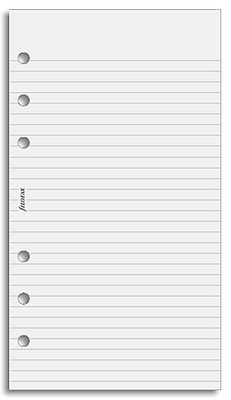 Because (like the party planner) this prints as a single sheet in booklet mode, you could just fold it and use it as a standalone booklet rather than cutting and punching to put in your Filofax. Welcome to the eighth session of Journalling School. In today's session we'll be looking at how you can keep things fresh when you get into a journalling rut. It is a good idea to introduce new elements into your journalling from time to time, because keeping things fresh makes it easier to maintain your interest and commitment. So, when things are starting to become a little stale, here is a way to find new inspiration. Have a look at this web page. The author lists 50 things he has learned in 50 years. Some of them are humorous, some profound, but every single one of them provokes thoughts and reactions. I used to have a printout of that article folded and tucked inside my journal. Not every day, but whenever I felt like it, I picked an item - the next in the list - wrote it in my journal and then noted my reactions and explained how my experiences related. This article of fifty points lasted me about three months. Before that one, I worked my way through several similar articles; the web contains thousands of them. Many are themed ('Twenty ways to be a nicer person' or '25 ideas that will make work more enjoyable', for example) and these can provide an interesting focus to your journal for a few weeks. Print off the article linked above, or a similar one. Fold and store it in your journal. At least twice this week, take it out and write about one of the items in the list. First, introduce what you're doing. Then write the item and then react to it. Write down your thoughts - do you agree with the idea or not; have you any relevant experience of having tried something like it before; how would you implement it tomorrow if you had to? That was the eighth session of Journalling School. In the next session we'll be looking at some questions that have arisen in comments so far, along with other frequently asked questions about journalling. I'm delighted to be hosting Helen's post about using the Filofax Flex. When you've read this post, be sure to check out Helen's fantastic blog, Fennell Books. Many thanks to Ray for letting me post my Flex update on his blog. I am a great fan of My Life All In One Place, so it is lovely to be a part of it! Over on Philofaxy, you might have seen my guest post about my new Flex. That was written about a month ago, when I first took delivery of it. I have now been using it in anger in the office, and thought an update would be useful. The cover is purple leather and I was surprised to see that the layout differs from my Husband’s original flex which he has had for some time. Before I had the Flex, I used an A4 bound notebook in the office. I find a bound notebook much easier to use, than a binder system for my work. However, there are loose bits of paper I need to carry around with me, which often used to fall out of my book, so the pockets in the Flex looked like they might work for me. 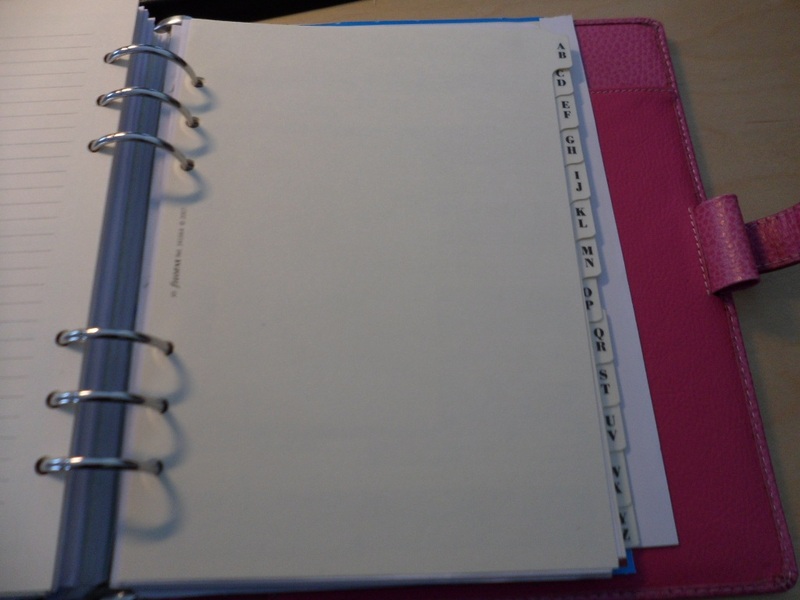 I was a little worried about bulk once I had loaded it up, but as you can see it is really very thin still, and much lighter than an A5 Filofax binder. On opening it up, I have a Moleskine notebook slotted into the left hand inner pocket, and a pen holder in the right hand outer pocket. The pen is a 4 colour Lamy. As an engineer I need to be able to mark up drawings in different colours, so having one pen to do all four colours is really helpful. In the front cover I have my Blackberry slotted in. The pocket also takes an iPhone. This change in layout from the first edition Flex is a real positive. I have to carry my Blackberry with me everywhere, and as my team are spread across three buildings in the town in which I work I spend a lot of time away from my desk. Carrying my phone around with a bound book meant I kept dropping it, or leaving it behind. Now it lives in my Flex, so I always know where it is. My note book is a lined Moleskine soft cover. The hardcover notebooks do fit, but it is really tight, and I was worried that I would damage the leather, so opted for softcover. Each morning I make a to-do list in my book with items carried over from the previous day if I haven’t closed them. Closed items get a tick in the margin, and items that I carry over get a horizontal line in the margin. I use my book to make notes throughout the day, whilst I am in meetings, talking to my team and to develop ideas. So far, so good. Now, for the reason I bought a Flex in the first place… the pockets. Each Monday I have to plan what my team are doing, and so I have lists and spreadsheets with workload histograms and reports which have to be completed. These are the bits of paper which I kept loose in my A4 book previously. They are now tucked into the inside right hand pocket. I only use them for the week, and they are then thrown away, so if they get a little dog-eared it doesn’t matter. If I wanted to keep something permanently in there I would be tempted to laminate it. This works really well. If I am away from my desk, I can instantly look up the availability of any of my team to complete urgent or ad hoc work. Everything is safe, there no risk of losing it, and I know exactly where it is. Also in the back is the list pad that was provided with the Flex. I wasn’t very sure I would use it, but now I have it I really like it. It is great for scribbles, thoughts, random shopping lists! I use it for both work and non-work related things which pass through my head and I need to capture. The non-work items then get transferred to my Filo for action later. Finally I have a few stickies as I find it handy to have some with me for leaving notes on people’s desks if they are not there. I have to say that I am really pleased with the Flex. It gets a hard time at work, and the leather is holding up really well. The colour is lovely and it looks professional. The pocket layout, particularly with a place for my Blackberry, is really good. I know a traditional Filofax doesn’t work for me as I prefer bound books at work, so this is a great compromise. So, if you are a bound book sort of person, who needs some pockets for extraneous bits of paper, then a Flex could well be the answer. Go on, you know you want to! My thanks to Helen for this insight into the Flex and how it works in practice. It's Blog of the Week time again, in which weekly a different blogger walks us through their Filofax blog. This week, it's Alison who walks us through Filo Obsessed. I started my Blog in May 2012 so i'm still relatively new to blogging. I started to use a Filofax again around April 2012; I'd used one previously many years ago. After searching online for a diary or Filofax or something similar I came across Philofaxy and after much research into different Filofaxes, Moleskine diaries and various other brands I finally settled on the Filofax. I enjoyed reading other blogs about set ups etc so thought why not start my own? The post that has enjoyed the most page views is A Few Peeks. I think i'm most proud of New me Part 1. This is because it's quite a personal post about how my Filofaxes had started to make me feel anxious, I just had too many and didn't have a clue what I would use them for. 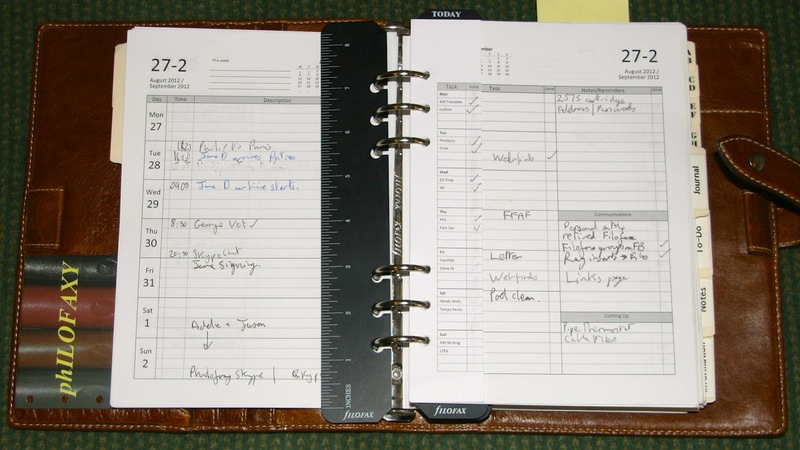 I'd lost sight of the reason why I first bought a Filofax which was to get organised. I was proud of the fact that I'd made a decision to sell most of them and just keep what I needed. My preferred size is now A5 but it took a lot of purchases and a lot of money to realise this. From the comments I received it seems that i'm not the only one to have bought Filofaxes to excess and as a result it's led to anxiety. I'm planning my Part 2 of this post over the next couple of weeks. I wasn't sure whether to start a blog or not, I wanted to but thought "surely nobody is interested in anything I have to say" and there are so many blogs on the subject that initially I felt out of my depth, but with each post I've gained confidence and I've realised "people are actually interested in what I have to say." The Filofax Community are a really friendly and helpful bunch of people and I have made some good friends, I'm just so glad I went ahead and started my blog. It's a blog about Filofaxes, stationery and getting organised but it's also quite personal too as I'm on quite a journey right now! If it's your confidence that is stopping you, just go ahead and set up a blog, your confidence will soon grow and you will make many new friends, receive lovely comments and start to believe in yourself. My thanks to Alison for participating. 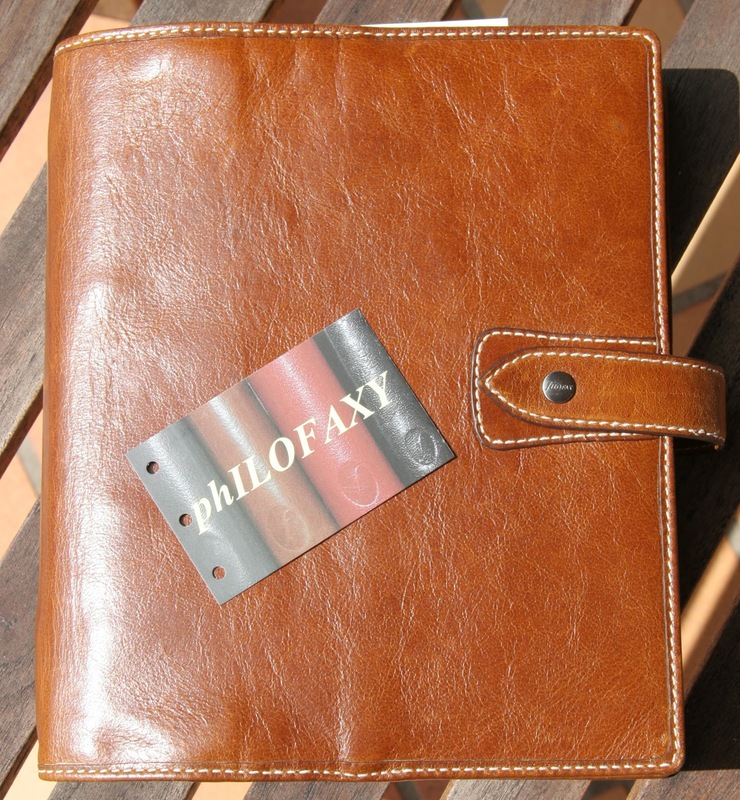 If you own a Filofax blog and would like it to be featured in this series, please complete the questionnaire. I was surprised (when I had cause to check) that Steve and I hadn't yet made a Personal size week per page layout for A4 printing. So here it is. Note that this is based on the Cotton Cream layout. It is simple and uncluttered and doesn't disrespect weekends. You can download the 2012 set as a Word file or as a PDF file. You can download the 2013 set as a Word file or as a PDF file. Print this double-sided. If you have a duplex printer, set it to flip on the short edge. If you don't then you'll have to print odd-numbered pages and then refeed to print the even-numbered pages on the reverse. You might have to experiment to find out how to refeed the paper. On one side of each sheet you'll find crop marks. Use a craft knife and a steel ruler to release the Personal pages and punch them. The templates are set up with mirrored gutters to accommodate the holes. You can also roll your own using our source files. You'll need this Word file and this Excel file. Welcome to the seventh session of Journalling School. In today's session we'll be looking at how your journal can help you solve many problems that might beset you. Have you ever lain awake at night or woken up early, your mind spinning frantically, fixating on an issue you are facing and refusing you the peace you need to sleep? If not, have you ever found yourself facing an issue that you can't see how to resolve, that ends up oppressing you, preventing you from enjoying the positive aspects of your life? Well, your journal can help you with these situations. In previous sessions, we've talked about using your journal to dump such worries, but today we're going to go beyond that. Because actually, journalling can help you not only cope with these problems, but actually resolve them too. 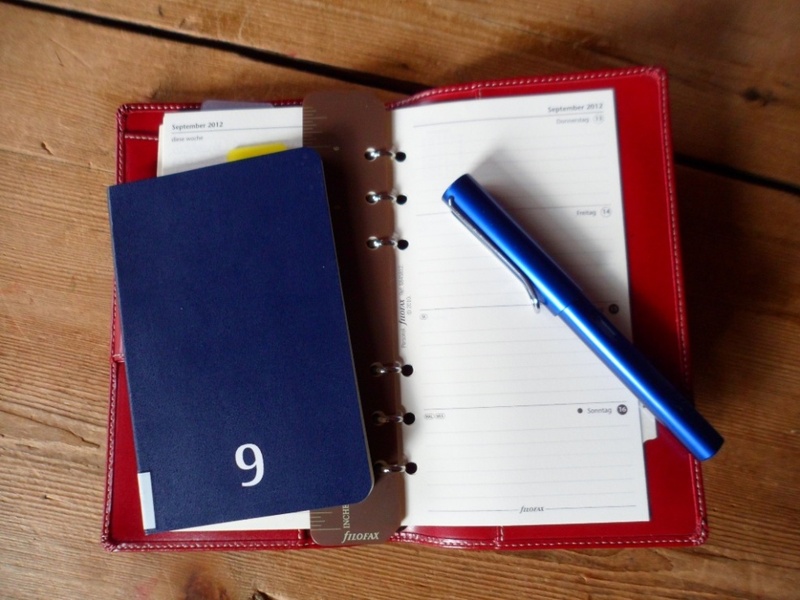 There are ten ways you can use your journal to solve problems. Actually, there aren't; or if there are, I don't know what they are. But if I wrote that sentence in my journal - "There are ten ways you can use your journal to solve problems" - I'm sure I could come up with ten. I am going to list twelve things I can do with the family at the weekend to make up for working late every day this week. And having written that in my journal, I then set about listing my ideas. Why twelve? Because it was a few more than I thought I'd be able to manage. I did manage twelve, although the last three needed a few minutes of headscratching. If I hadn't had the target number to fulfil, I would have stopped at nine. That would have been a shame, because number eleven was a real gem of an idea. I have used the technique quite widely already, and giving yourself a stretching target really does pay dividends. There are ten things I can do right now to save money. I can think of five ways to help me stick to the diet I keep breaking. Here are twelve things I can do this month to help make my career change. There are six ways I can try to repair my relationship with my neighbour. To reiterate, you don't have to know what any of the numbered things or ways are when you write down that introductory sentence. Writing it down is challenging yourself to fulfil the commitment you just made. Make sure you persist and actually meet the quota, even if some of the ideas seem a bit silly. Often, writing down those silly ideas can be fantastically useful, because it makes you hold them in your head longer than you normally would, where they can inspire other, potentially viable ideas. If you are facing a particular problem, use the technique. Challenge yourself by choosing a number which is more than you think you can come up with. If you believe you might be able to find six or seven ways to earn more money, for instance, write down: There are ten ways I can start earning more money right away. Then keep writing until you have listed ten. If you find it easy, then keep going; identify more ideas and next time give yourself more of a challenge. If you don't have a particular problem, then go back to your goals and apply the approach with one of them. Write something like: There are six things I can do tomorrow to help achieve my goal to... As above, don't stop until you've met the challenge, and keep writing of you get there quickly. Finally, turn your ideas into scheduled activities in your planner, or undated tasks where you can't assign a time and date. That was the seventh session of Journalling School. In the next session we'll be looking at keeping things fresh in your journal. Everyone knows Steve, the King of Philofaxy. I am delighted to host his All Stars guest post. I knew that Steve had been developing his setup this year, so I thought it would be nice to see where he is up to with it. When you've read this post, be sure to check out Steve's posts on Philofaxy and at Steve-Morton.com. Thanks to Ray for this chance to share with you the details of my current 2012 Filofax set up . The current organiser is an A5 Malden Ochre and I love this colour. I bought it on Philofaxy Ad-Spot from a reader in UK. It didn’t come with any inserts or accessories, but that didn’t worry me; I just transferred the contents of my grey A5 to this organiser. So starting at the front and working to through the different sections in the time honoured fashion! You will notice I don’t keep any cards or stickers in the front pockets. The flyleaf is also a tad plain vanilla too! My first section is my ‘Notes In’ section. It contains a few sheets of lined paper and a couple of to-do sheets. I use this section to capture things if I have the organiser away from my desk and I just want to quickly jot something down if we are in a meeting or seeing clients or if I have a sudden brain wave and I don’t want to forget it in a blink of an eye… which happens too often these days. Then we come to the planner section. 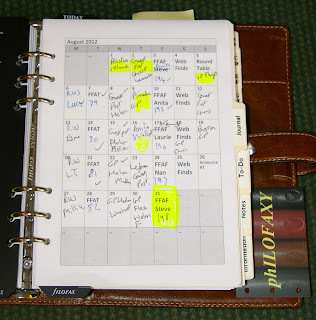 This starts off with a 2012-year planner, I use this mainly for planning visits to UK, visitors to our house here in France and any other significant dates. We then move in to the main core of my planning section my A5 Enhanced TM insert designed and created by Ray and myself. It’s been tweaked a couple of times since its original publication, I’m not even using the latest version myself yet! But for me this has been working very well, with enough appointment space for my day-to-day requirements. I’m very task and reminder driven so the right hand page with all the reminders and to-do’s gets extensive use each day/week. I’ve made a personalised thin reoccurring tab that slots in neatly to remind me of site updates of which there are two each day. These are printed on 160 gsm card, so I rub out the ticks and they get reused each week. This saves me from having to write out the names of the sites each week. I slot in a To do sheet for big events/projects such as Philofaxy meet ups, one side will be my packing list, the reverse the names of people attending and the reserve list with phone number details written on it in case of any last minute no shows. Towards the end of my planner section I then have a 2013-year planner…empty at the moment. Then I have a month per page insert purely for planning Philofaxy blog posts, this is a customised version of the A5 month per page insert created and published by Ray and myself. The customisation is the inclusion of the FFAT, FFAF rota, Web finds, Roundtable dates etc. These are already included to save me having to write them in. I use a highlighter pen to show up dates that don’t currently have a post allocated to them. Sometimes I also add notes to the days when I might not be about so if it happens to be a Tuesday or a Friday I will know to do Webfinds a bit earlier in the cycle of things. Moving on to the third section this is my journal section this is just a standard Filofax week per view A5 insert, but the English only one as it has equal spaces per day including weekends. I’m not a big journaling person, but I am trying to get better, I’ve been following Ray’s excellent series on journaling to improve my skills….. work in progress as they say! Next year I will print my own diary insert for my journal but on decent quality paper so I can use a gel pen or fountain pen without the issue of bleed through on the pages. 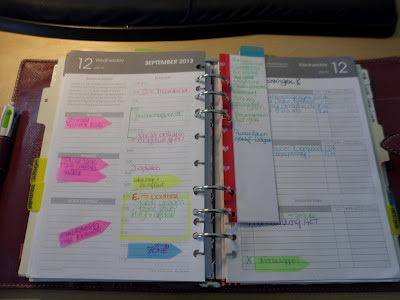 I should say at this point I use three Today markers, the first to indicate the current week in the planner section, the second to indicate the blog month planner, and the third is the current week in my journal section. 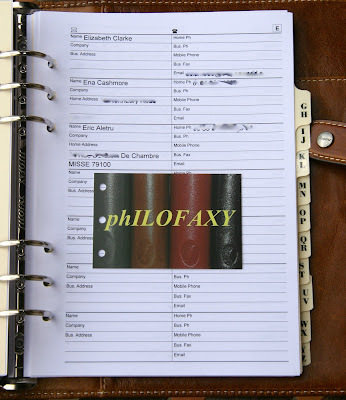 These are just standard Filofax ordinary boring black today markers… no stickers or anything fancy! My next section is my ‘To-do’ section it’s mainly used for long term to do planning and spare sheets, so it’s a fairly thin section. Similarly the next section is devoted to Notes, where I jot things down in and then the notes get moved elsewhere or transferred in to the planner. Next is my ‘Information’ section, it contains reference information such as the instructions for changing time zones on my over complicated watch! It’s a great watch being solar powered and also locked to the UK National Physical laboratory atomic clock frequency standard radio transmissions… but if I travel from UK to France or vice-versa I have to change the time zone, it’s quite straight forward to do, but I’ve messed it up too often, so I now carry the instructions in my Filofax! I also have Tube maps, road maps, railway maps, and an A3street map of London, all self printed and they all fold neatly in to the A5. The last section of my A5 is my Address/Site information section this is another busy section for me. The names and addresses I maintain using the FilofaxAddress book software and these are printed off on to A5 paper with 7 contacts per side and a new letter per sheet. I index these in standard A-Z two letter tabs. I index all my contacts in first name order, for some reason I can remember someone’s first name but not always their second name (family name). I update the database a couple of times a year and print off new sheets for my Filofax. Between the first and second letter in each section (A&B, C&D) I keep an Internet site information sheet one side for the first letter, the reverse for the second letter. These are sheets I created myself available on Philofaxy, They list the internet site, user name and password… but not the full password as I code all of my password entries so these just act as a reminder for the actual password. So if these sheets were lost or stolen my passwords would remain safe. As well as the password these sheets help me remember what username or email address I’ve used to access numerous sites that I use on a regular basis. Setting up a new computer or device is infinitely easier when you have all of your account details to hand. I curse others that don’t record their account details in some shape or form!! And we have now arrived at the back cover… I don’t use a note pad in the back cover of this Malden, I found I wasn’t using it that often and it just adds to the weight, which by the way is just a shade over 1 kg. It has been heavier than this but I archive pages these days to keep the weight down. This year I have concentrated on getting a set up that works for me, especially the planner set up. I might tweak a few things for next year, but at the moment it’s working very good so far. Thanks for this look inside your system, Steve.